Tá Gaeilge úsáidte ag an Protestant Coalition ar leathanach Facebook an pháirtí dílseachta conspóidí. Cén fáth a deirim go bhfuil siad conspóideach? Sa chéad dul síos seo páirtí atá tar éis tacaíocht a léiriú d'ionsaithe ar an PSNI, nó an PSNIRA mar a ghlaonn siad orthu go minic. Is é Jim Dowson, iarbhall den pháirtí faisisteach, an BNP, duine de na bunaitheoirí. Bhunaigh sé páirtí fíordheis eile, Britain First, chomh maith, agus tá ceangal láidir idir an dá ghrúpa. Mar aon le sin tá rabhaidh déanta go minic ag an PC go bhfuil baol ann go rachaidh dílseoirí i mbun 'cogaíochta' má leantar le cúrsaí mar atá ó thuaidh. Creideann siad chomh maith go bhfuil Facebook i mbun comhcheilg frith-Phrotastúnach agus frith-Dhílseachta toisc go bhfuil ceanncheathrú an chomhlachta lonnaithe i mBaile Átha Cliath. Mar sin, is páirtí antoisceach lán le gealta é an Chomhghuallaíocht Phrotastúnach. Ach más féidir le páirtí mar seo an Ghaeilge a úsáid is léir nach baol í an teanga don fhéiniúlacht Aontachtach. Chuir an páirtí físéan faoi Léigear Dhoire ar an leathanach Dé hAoine (9ú Lúnasa) ach ní raibh gach duine sásta go raibh sé i nGaeilge (tuigtear gur cuireadh clár faisnéise faoin léigear i mBéarla ar an leathanach níos déanaí). “I prefer the English translation rather than this Leprechaun language…NO SURRENDER,” a dúirt John MacLaughlin. Dúirt an Chomhghuallaíocht áfach go bhfuil Gaeilge ag Protastúnaigh in Albain. “tens of thousands of Scottish Protestants speak the Gaelic! !” arsa an páirtí. Níor ghlac an tUasal MacLaughlin leis an dearcadh seo. 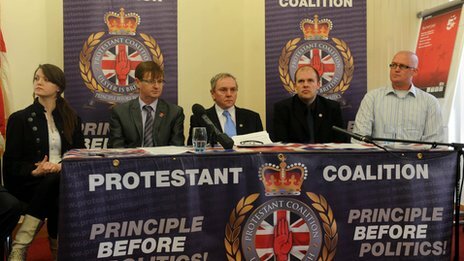 “Maybe so but we are in Northern Ireland and the majority speak the English language. Far too many times we see the likes of bbc and the media use this leprechaun language on the t.v. and in the papers. Everybody to their own but I shall not be using it as 99% of my friends wouldn’t understand me,” ar seisean. 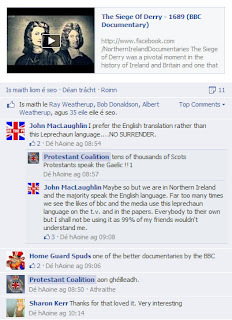 Scríobh an Protestant Coalition ‘aon ghéilleadh’ ar an snáithe níos deanaí, an t-aistriúchán ar ‘no surrender’ atá ag Google Translate. Leiríonn suirbhé ar antuairisceoir.com nach gcuireann sé seo isteach ar phobal na Gaeilge. De réir na dtorthaí is déanaí tá 1% (duine amháin go dtí seo) den tuairim gur le náisiúntóirí amháin an teanga agus tá 3% (beirt) idir dá chomhairle. Creideann 96% (68 vóta) go bhfuil an ceart ag gach duine an Ghaeilge a úsáid.